Cycling and trucks got a bit of media attention in Christchurch a couple of weeks back after the scary incident in Sockburn. I don’t know all the specifics of this case yet, although I’m glad to see that the unfortunate rider has made a great recovery. But it does highlight the fact that heavy vehicles such as buses and trucks demand some extra respect from people riding around our streets (and we would hope that their drivers also do likewise to us). One particular concern with heavy vehicles is in the severity of crashes involving them. Although, nationally, trucks and buses are only involved in about 6% of all cycle crashes, 30% of motor-vehicle related cycle fatalities involved a heavy vehicle. Although the crash movements vary, a reasonably common incident involves a cyclist being caught on the left‐hand side of a truck (possibly turning left) and being swept underneath the truck wheels. This highlights the benefits of truck side under‐run protection (as used in other countries), something that groups such as the Cycling Advocates Network (CAN) has been calling for over a decade to make mandatory here. CAN has also been working with bus and truck companies to get their drivers alongside people who cycle to discuss cycle safety issues and get each party to experience the “view from the other seat”. These “road user workshops” have been very successful at generating empathy and understanding at the issues faced by both parties when out on the road. 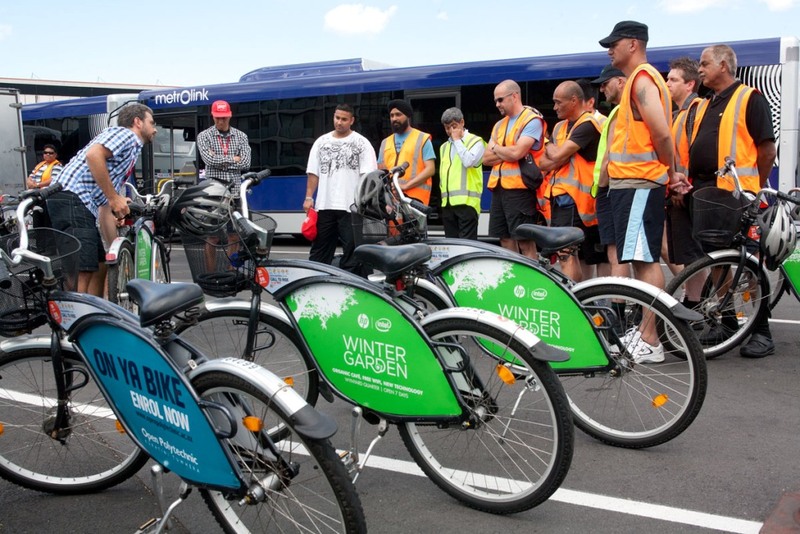 We had a pilot workshop in Chch for bus companies back in 2010 that went very well, and hopefully there should be some more rolled out down this way in 2014. CAN also helped to develop some promotional material for NZTA on “Safety tips for cyclists and truck/bus drivers”, which provides lots of useful advice for all parties. Both drivers and riders also need to be aware of the blind‐spot limitations when cyclists are near heavy vehicles. As part of the road user workshops, bike riders get to sit in the driver’s seat, and it is quite surprising how little you can see in certain directions (see diagram below). So riders need to be mindful of that when sneaking up the side of a large vehicle. One simple rule of thumb: if you can’t see the vehicle’s mirrors, then the driver certainly can’t see you. Additional side mirrors focused on blind spots may also be a prudent idea in NZ, as is now required in Europe. If you’re approaching a signalised intersection and there’s a stationary bus or truck up in front of you, be particularly wary of creeping up the side, even if there’s a cycle lane. Unless you are certain that the signals are not going to change soon, stay behind; discretion may be the better part of valour. If you do get to the front, make sure you’re well in front of them, where they can clearly see you. Another feature of large vehicles is that the rear wheels tend to take the shortest path possible through a curve (especially trailer units). Most heavy vehicle drivers should be aware of this when passing you, but it still pays to keep an eye on things. So even if the front part of a vehicle has safely gone past, if they are going around a curve in your direction watch that the back of the vehicle doesn’t catch you. Because of their limited turning circle, large vehicles may also initially move over to the right before making a tight lefthand turn. This is not an invitation for you to sweep past on the left! The NZTA has other useful advice for riders when dealing with trucks and buses. Overall, the key message is to recognise that they don’t operate in the same manner as a car and, because of their size, you need to take extra care when near them. What’s your best tip for riding near trucks and buses? As a neophyte cyclist I learned a huge amount from cycleGaz’s Silly Cyclist’s (http://www.sillycyclists.co.uk/) video blog. Never undertaking trucks or busses is one of the main points. 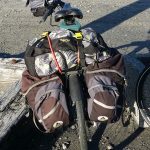 I have just heard of the tragic death of cyclist in Christchurch, in a crash with a left turning truck. Looking at the road layout on Google it looks pretty scary. Is that a cycle lane on the left of Carmen road southbound? it ends just at the junction where it seems that a great number of very heavy trucks turn left. I would be very surprised if there had not been similar crashes at that site. Is that route heavily used by cyclists or are they infrequent? This is the truck drivers second time he has killed a cyclist. Previous Previous post: Flat Tyre, Redux.